While it’s generally important to work hard when pursuing your goals, hard work rarely pays off if you don’t know how to work in a smart way. When it comes to working in a smart way, the Pareto principle, which is often called the 80/20 rule, and which suggests that roughly 80% of the outcomes come from 20% of the causes, is one of the most effective guidelines that you can use. Because this principle is so effective, and because it’s relatively easy to implement, it’s highly beneficial to understand how it works. As such, in the following article you will learn more about the Pareto principle, see examples of how it applies in various situations, and understand how you can use it yourself, as effectively as possible. The Pareto principle (also known as the 80/20 rule) is the adage that in many situations, 80% of outcomes are derived from 20% of causes. For example, the Pareto principle could mean that, when it comes to movies, 20% of the films that are being shown in cinemas are responsible for 80% of the ticket sales. The ‘outcomes’ and ’causes’ that the Pareto principle refers to are varied in nature, and depend on the situation at hand. For instance, ‘outcomes’ can refer to anything from financial profit, to customer complaints, to acquisition of knowledge, while ’causes’ can refer to anything from financial investments, to software features, to time spent working on certain tasks. As such, the Pareto principle has been found to apply in a wide range of situations, and it has predictive value both when it comes to individuals, as well as when it comes to large groups. The best-known example of the Pareto principle is attributed to Vilfredo Pareto, the Italian economist after which this principle is named, who observed that 80% of the wealth in Italy is owned by 20% of the population. A study which analyzed shopping patterns at convenience stores found that approximately 20% of the customers account for 80% of the stores’ sales. A study on software engineering found that roughly 20% of the modules cause 80% of the operational faults. A study which analyzed circulation patterns in libraries found that around 20% of a library’s books account for 80% of its circulation. The Pareto principle is based on the concept of power laws. Simply put, a power law is a type of functional relationship between two quantities, where a linear change in one quantity leads to an exponential change in the other quantity, meaning that one quantity varies in proportion with the power of another. A simple example of a power law is the relationship between the length of the sides of a square and its area. This is because the area of a square is equal to the length of its sides to the power of 2, which means, for instance, that increasing the length by a factor of 3 increases the area by a factor of 9 (i.e. by 3^2). 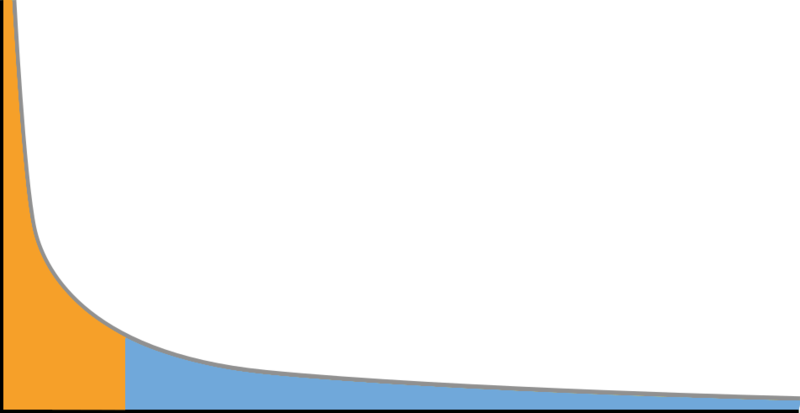 The Pareto principle suggests that in many situations, we can expect to find a Pareto distribution, which is a specific type of power-law distribution that contains a negative exponent, meaning that that as one quantity increases, another quantity decreases as a power of the initial quantity. For example, a Pareto distribution could occur in the relationship between income level and number of earners, if by increasing the income level by 3, we expect 9 times fewer individuals to earn that much (i.e. 3^(-2), which is equal to 1/9). A relatively small number of books account for a large portion of book sales. A relatively small number of scientific papers receive a large portion of academic citations. A relatively small number of websites receive a large portion of internet traffic. Note how skewed and heavy-tailed the distribution is. Let’s assume that this graph shows the portion of the wealth in a nation on the vertical y-axis, and the number of people who own it on the horizontal x-axis. This means that on the left of the distribution we have what is often referred to as the Vital Few, who are the minority of the people that own the majority of the wealth, while on the right we have the long tail with the Trivial Many, who are the remaining majority of the people who own the minority of the wealth. Note: from a mathematical perspective, there is more complexity to the concept of power laws and Pareto distributions beyond what is included in this article. However, the vast majority of this information isn’t important to understand from a practical perspective. The Pareto principle refers to a specific, common type of Pareto distribution, where 80% of the outcomes come from 20% of the causes. However, Pareto distributions aren’t constrained to an 80/20 split, and there is sometimes variability regarding the exact distributions which are found. This means, for example, that a Pareto distribution might involve a 75/25 split, or an 85/15 split, and so on. As such, the exact distribution doesn’t matter when it comes to implementing the Pareto principle. Rather, the important thing to remember is that a small portion of the causes will generally be responsible for a large portion of the outcomes, whether that small portion is 20%, 30%, 10%, or any similar quantity. A concept that is related to the Pareto principle is Zipf’s law, which also involves a power-law distribution, and which states that in certain samples, the frequency of an item is inversely proportional to its rank among other items of the same type. For example, Zipf’s law means that in a large, random sample of written or spoken words, the frequency of any word is expected to be inversely proportional to its rank in the words’ frequency table. Essentially, this means that the top few most popular words in the sample (which in English are words like “the” and “a”), are expected to account for the majority of the word-tokens which appear in the sample. Note: a Zipf distribution can be described as the discrete version of the Pareto distribution, since it uses the rank of items, as opposed to the continuous version of the distribution, which uses their values. However, this distinction is not important to understand from a practical perspective. The main goal of the Pareto principle is to help you concentrate your efforts as efficiently as possible, by focusing on the small proportion of causes that are responsible for a large proportion of outcomes. If you’re running a business, focus on working with the 20% of customers who generate 80% of your profits. If you’re studying for an exam, focus on the 20% of the material which accounts for 80% of the questions. If you’re developing a software product, focus on the 20% of features that are important to 80% of the users. Avoid working with the 20% of customers who produce 80% of the complaints. Fix the 20% of the bugs which lead to 80% of the reports. Avoid the 20% of physical exercises which cause 80% of the injuries. It’s important to keep in mind that sometimes, there can be an overlap between the few causes that lead to the majority of the positive outcomes, and the ones that lead to the majority of the negative outcomes. In certain cases, what you should when this happens is relatively clear-cut. For example, if 20% of the material that you have to study will account for 80% of the questions on the exam, then you will need to understand this material even if it causes 80% of your issues. However, there are some situations in which the optimal course of action isn’t clear. For example, if 20% of the customers generate 80% of your revenue but also 80% of your complaints, then you will have to consider your priorities before deciding how to act. There will likely be significant variation even within the top 20% and the bottom 80%. That is, there can be a big difference even within individuals that belong to each of these groups, and if your sample is large enough, you might find that the top 20% and bottom 80% can be further divided using an 80/20 distribution, possibly more than once. For example, even among the top 20% of earners in the population, there is a substantial difference between the top few people who earn the most, and the rest of the people. The Pareto principle doesn’t apply in every situation. Though many natural situations feature a Pareto distribution, there is no guarantee that it will apply in the specific scenario that you’re dealing with, and there are situations where a different distribution might be more relevant. 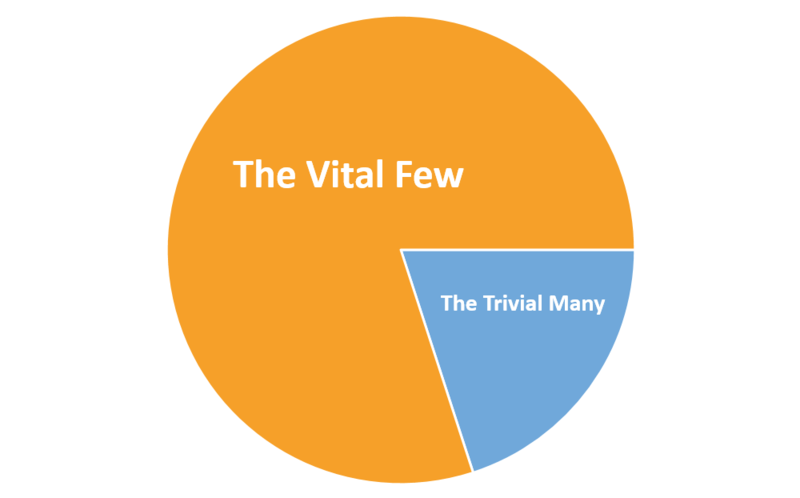 The Pareto principle isn’t just about an 80/20 distribution. Though the Pareto principle refers to an 80/20 distribution in particular, in practice you might run into a variety of other distributions, such as 90/10 or 70/30. As such, the key takeaway from the Pareto principle is to look for situations where a small proportion of causes is responsible for a large proportion of outcomes, rather than to look for a specific ratio between causes and outcomes. In addition, if you’re engaging in a long-term process, make sure to reevaluate your situation periodically, and adjust according to the Pareto principle each time, as the distribution between the relevant causes and outcomes may shift over time. Finally, as with any other guiding principle, when applying the Pareto principle you should make sure to use common sense, and take into consideration any additional factors that might be important, beyond the cause-outcome relationship. For example, this means if you offer a software service, and you’re trying to decide which bugs to fix based on how many users reported them, you will likely want to fix a serious bug that can cause critical security issues, even if only a single user noticed it. The Pareto principle (also known as the 80/20 rule), denotes that roughly 80% of the outcomes occur as a result of 20% of the causes. For example, the Pareto principle means that 20% of the customers will generally be responsible for generating 80% of a store’s revenue, and that 20% of the software bugs will be responsible for 80% of the user complaints. You can use the Pareto principle in order to work more efficiently, by focusing your efforts on the areas that will allow you to generate more positive outcomes or eliminate more negative ones. Pareto distributions don’t always involve a perfect 80/20 split, so the key thing that you should look for are areas where a small portion of the causes is responsible for a large portion of the outcomes. If you’re using the Pareto principle in order to make a long-term process more efficient, you should reevaluate your situation periodically, and reapply this principle each time.